CarGurus has 4,620 nationwide A3 listings starting at $3,900. Audi's new sedan-style A3 has been a huge success, offering AWD luxury and Audi style with some VW heritage. When bragging to friends about my week with the A3, most comments fell along the lines of, “Isn’t that a wagon?” Ready to dismiss nearly anything that reminds them of the 5-door family funster they grew up despising, Americans have always been reluctant to attach the “cool” label to a hatchback, no matter what we call it. The proof? When the A3 was offered only as a Sportback, Americans simply didn’t care. Flash forward 2 years and one chopped rear later, and Audi can’t make A3 sedans quickly enough. Indeed, fellow colonists, we may now rejoice in that blessed combination of 4 doors, 5 seats, and a trunk as the A3 rolls anew, fresh from a 1-year hiatus, in sedan form. A 4-seat convertible comes later this year, but for now you’ll have to be satisfied with what I consider one of the cleanest vehicle designs on the road. Look no further than the integrated rear spoiler for the most obvious example: attractive and functional, but never flashy, never overreaching. Of course no one would call an Audi ostentatious. In fact, the A3 is the perfect example of understated grace in automobile design, and many would have trouble distinguishing it from its larger brethren at more than a dozen feet or so. This is generally easy to do as cars continue to bulge and swell their way into ever-increasing safety regulation, to wit: The current A3 sports nearly identical dimensions to the original A4. What results is well-proportioned, agile, and effective. Buyers agree, and Audi credits strong A3 sales as a major contributor to climbing sales and standing, especially among younger drivers. This despite attempts to slander the A3 as nothing more than a tarted-up GTi. And while those accusations are not without merit, with the A3 and GTi sharing VW's MQB platform and 2.0-liter engine, until the A3 offers a front-wheel-drive-only hatchback option, it’s like comparing apples to imaginary apples in 2015. For this test, Audi sent me a 2.0T quattro S tronic with the more powerful 220-hp engine, all-wheel drive (AWD), and the Sport package ($550), which adds sport seats, Audi Drive Select, and paddle shifters for the 6-speed, DSG S tronic double-clutch automated manual transmission. 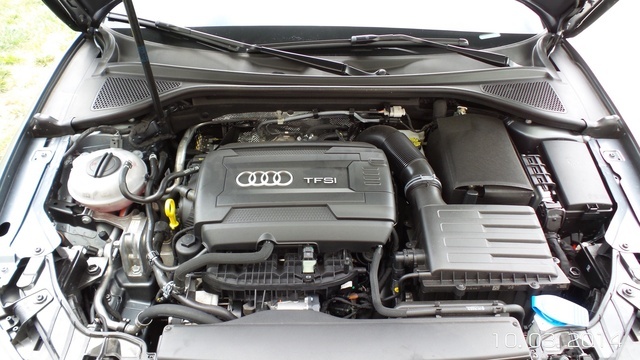 This A3 also came equipped with the Prestige package ($8,450! ), which added 18-inch wheels with summer tires and the S-line exterior, with LED headlights, running lights, and interior lighting, along with aluminum window surrounds and trim. The Prestige package also adds the majority of the tech available, like heated seats; auto-dimming mirrors with heated, power-folding exteriors; Audi advanced keyless entry and engine start/stop; Audi MMI with navigation, Audi Connect, voice control, and a touchscreen; and a Bang & Olufsen stereo. Audi side assist for blind-spot monitoring is also included here, as well as Audi's parking system plus with a rear-view camera. Along with the Monsoon Gray metallic paint ($550) and the Destination Charge ($895), the total delivery price of this A3 came in at a stout $43,345, more than $10K above its MSRP of $32,900.00. While I find it hard not to cringe slightly at the thought of a luxury car with a 4-banger, I can’t argue the good times I’ve had wringing out VW 4-cylinder engines. The A3 is no disappointment in this arena. The engine idles and comes off the line with only the slightest vibration or hint of roughness and begins sweeping through the rev range with authority. Pop it into Sport or click the Audi Drive Select into Dynamic and you’ll be rewarded with a transmission that keeps the revs higher and the turbine spooled for nearly immediate power. There’s a bit of hesitation if you’re cruising around in Drive and just stomp on the pedal, but with a couple of clicks on the paddle shifter, you’re ready for launch. 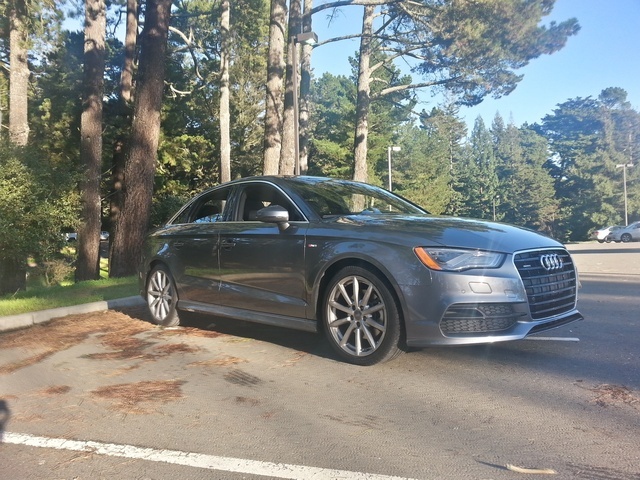 I took the A3 from my home base of the Bay Area down to L.A. one fine weekend and found that my favorite configuration was with Audi Drive Select in Dynamic, but the transmission in Drive rather than Sport. This kept the revs down for cruising, but as soon as I wanted to pass, power was just a couple of clicks away. When it came time to toss the A3 down some canyon passes, Sport was waiting to do its duty. And it did so with pleasant precision. I’ve been reluctant to accept dual-clutch transmissions, especially in cars primarily designed as daily drivers rather than track attackers, but the A3 won me over here. Shifts are lightning fast whether you’re taking over via the paddle shifters/MSG or letting the computer do the work. There’s only a slight amount of the usual juddering at lower speeds, easily mitigated once you get used to operating the throttle. The Haldex (not Quattro) AWD system puts the power down with confidence thanks to an electronic torque-vectoring system that will brake a wheel once it starts losing traction. It’s not as stout a system as the actual Quattro sport differential, but this isn’t a track or rally car, either. Plus, it’s a wonderful surprise to find a car that can handle rough highways without destroying your spine and still manage to put a smile on your face in the corners. Don’t listen to those who are wont to put down anything by Audi that doesn’t wear an S or RS badge—this car is fun. I found the steering to be perfectly weighted if a bit lacking in actual communication, and while the A3 doesn’t offer the softest leather in the automotive marketplace, the wheel is clean and the perfect size for my big mitts. 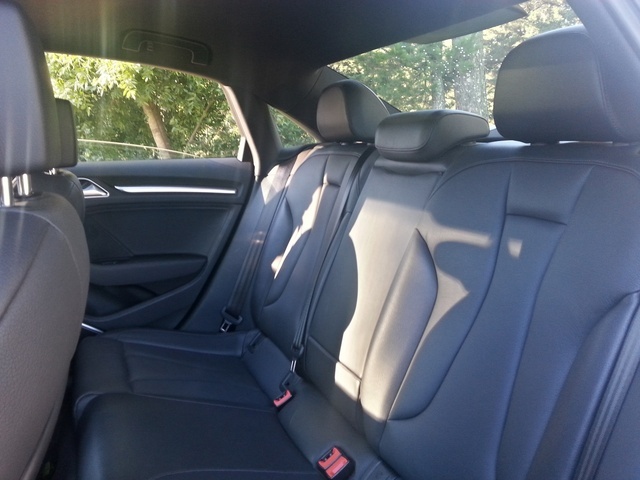 The sport seats that came with the Sport package were extremely comfortable and adjustable with a 4-way lumbar alone. It was only after driving 5 hours that I felt the need to readjust, and they held on nicely when the lateral Gs started building, too. My one complaint was the seat extender on the front seats. It was nice to have extra leg support, but it never felt very solid when extended. The brakes, however, were about as solid as can be—not particularly grabby at slow speeds, but supremely confident when pressed, and I didn’t witness any fade despite a nice coating of dust on the front wheels after my L.A. turn and burn. Especially with the summer tires this A3 had, the brakes just seemed to eat speed. With all this in mind, something kept eating at me the entire time I was driving the A3: I would love to see this car with an inline 5-cylinder. It’s a definitively Audi engine, and with the monster numbers Audi was cranking out of the 2.5-liter inline 5 they put in the TT RS, I’ve got to imagine they could detune it quite a bit and recover a lot of efficiency while still managing to stand apart from the seemingly endless sea of small luxury cars packing turbo 4s today. Pie in the sky, I realize, but as long as I’m wishing for transmissions that aren’t offered already…. I’m still not sure if the current class of Audi will be considered classic 20 years down the road, but I’m certain the A3 is one of the most attractive vehicles for sale in 2015. This is especially true from the rear, as I just can’t get enough of that integrated spoiler. Accent lines starting up front, running along the sides and over wheel wells to complete at the rear bumper have the same effect: subtle then striking, almost hiding the style contained within. And the once-contentious front end has become iconic Audi. My money is on these becoming classics. The 18-inch wheels that come with the Prestige trim fill the wells perfectly without the need for 19- or 20-inch ride-ruining nonsense. They’re also available as an $800 standalone option, and I think they’d be worth it. The Sport package’s seats and steering wheel were both very nice, but I haven’t sat in the regular seats and would be very interested to see if they hold up as well. Audi Drive Select is the real selling point here, along with the paddle shifters on the steering wheel. I’d prefer a traditional 3-pedal setup, but this is a nice alternative for the 90-some-odd percent of buyers who could care less about a clutch pedal. But I was disappointed to find the paddle shifters constructed of a not-so-special plastic rather than something more appropriate for such a central fixture of the drivetrain. Would you ever see a plastic shift knob in a 3-pedal manual? Aluminum or carbon fiber, please, or at least add some rubber pads to the back, so I feel like I’m pulling something substantial. Painted in Monsoon Gray Metallic, the A3’s sticker price rose $550, as will happen with any color other than Brilliant Black, something I really detest in auto pricing. Along the same lines, half of the interior choices will add another $800. Aluminum accents might brush up against “too flashy,” but still manage to remain classy, even with knurled surrounds for the aircraft-inspired vents. Hunting for hard plastics will be a frustrating exercise, aggravated only by finding some here and there. Hard plastic surrounds on the B-pillar getting knocked and scratched by the seatbelt when not in use are a perfect example and a real shame to find. There was so much tech packed into this Audi that I sometimes felt as though I had to ask permission to take over and drive. And this A3 wasn’t even fitted with the Technology package that would’ve added lane-keeping assist, frontal-collision avoidance, and adaptive cruise control. It’s a system I’ve experienced previously, and it really can end up feeling like a gruff nun standing over your shoulder, ready to chastise for the first offense, but there’s no arguing its efficacy, and it’s a welcome if not necessary backup to have. 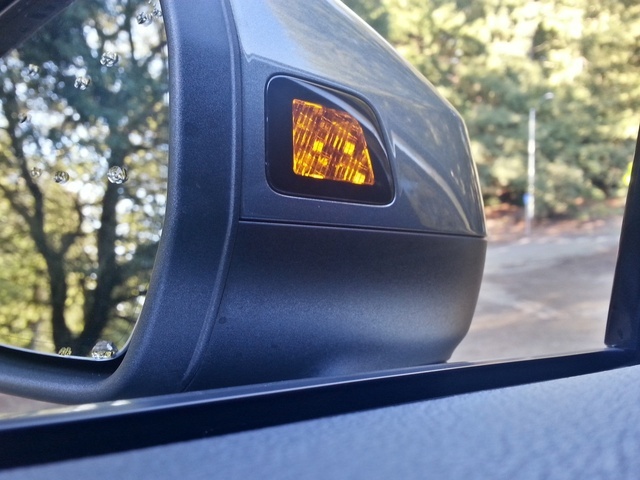 The blind-spot monitoring is my favorite part, especially with the indicator lights located on the inside of the mirror, where they won’t get washed out by the sun. After a while, I found myself failing to actually turn and check behind me before changing lanes, which speaks well for the system itself and my confidence in it, but perhaps poorly for safety in general. The upgraded Bang & Olufsen stereo certainly… well, banged… and allowed for clear conversation even with the music loud. 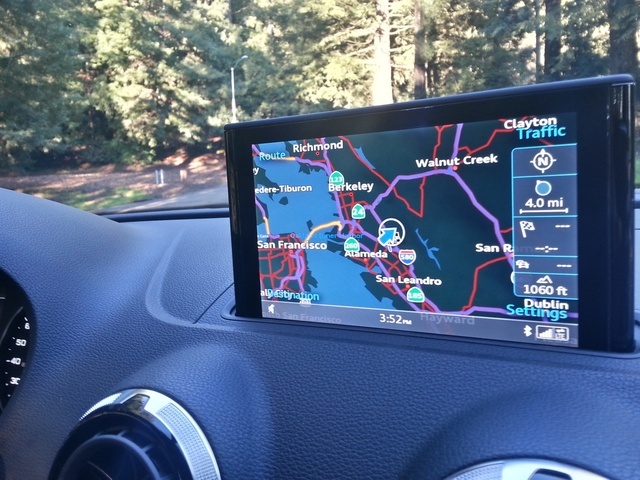 Audi Connect turned the A3 into a mobile WiFi hotspot via AT&T 4G LTE, and during the entire ride between the Bay Area and L.A., I encountered only a few short dead spots. The A3 comes with 6 months of free service, but after that you’ll have to choose between a 6-month/5GB option for $99 or the upgraded 30-month/30GB plan for $499. The real treat was Audi’s MMI system. While I still believe all navigation systems are a short-sighted inclusion in cars, destined to be outdated and viewed in the same light as we see in-dash 8-track players, the MMI system was easy to use and accurate. A pleasant change from the frustrations I find in testing out rival navigation systems, and to combat my criticisms slightly, the MMI system is capable of upgrading both hardware and software, meaning it could stave off obsolescence in theory. Whether or not Audi will do this in practice remains to be seen. Especially useful was the MMI controller, a rotating knob with an integrated touchpad that allows you to input via tracing letters and numbers. I’m a lefty when it comes to writing, and I found this controller shockingly easy to use, even with my right hand. I’d go so far as to say it even felt natural, so lefties of the world, you may abandon your apprehensions. Having a console largely free of screens and buttons is a refreshing change, but I’m still not sure how I feel about the 7-inch display that rises out of the dash. Its operation is flawless, and the fact that I can stow it at will is welcome, but when it’s up I just can’t shake the feeling of last-minute design—that it’s a technology shoehorned into a product with little long-term vision. Six standard airbags, including driver and passenger knee and thorax bags, are supplemented by curtain airbags, and rear side airbags can be added. All seatbelts come with automatic pre-tensioning, and every Audi A3 comes with standard stability and traction control. Government testing has earned the A3 a 5-star rating in all categories except frontal impacts, in which it earned a 4-star rating, and the Insurance Institute for Highway Safety (IIHS) named it a Top Safety Pick Plus, with top ratings in all categories. Fitted with all-season tires, expect braking from 60 mph to happen in under 120 feet. With summer tires that’ll drop close to 110 or less, which is damned impressive, even for this category. Opt for the technology package with the added lane-keeping assist, pre-sense front braking, and adaptive cruise control, and I’m not sure you’re even legally allowed to get into an accident. This is the question that’ll send gearheads into a tizzy. Yes, the particular A3 I drove stickered well above $40K, and that’s a hell of a jump from the GTi, which offers the same platform/engine/transmission and even the choice of a manual should you want it. That said, you could still drive away in an A3 with the 2.0 and AWD for a little over $30K. Would it bother you every time you pass a GTi that the cars are essentially the same underneath all that pretty skin? Could you care less about AWD? If so, I’d look elsewhere. If you’re looking for exclusivity in a luxury car and want to stay German, there are BMWs and Mercedes out there that’ll fit the bill nicely. But that doesn’t mean you should discount the A3. Not in the least. This is a damned fun car, and it's well worth the money. Stay away from the options list, and it’s very reasonable, especially for what you get. But please, Audi, can we have a manual option? What's your take on the 2015 Audi A3? 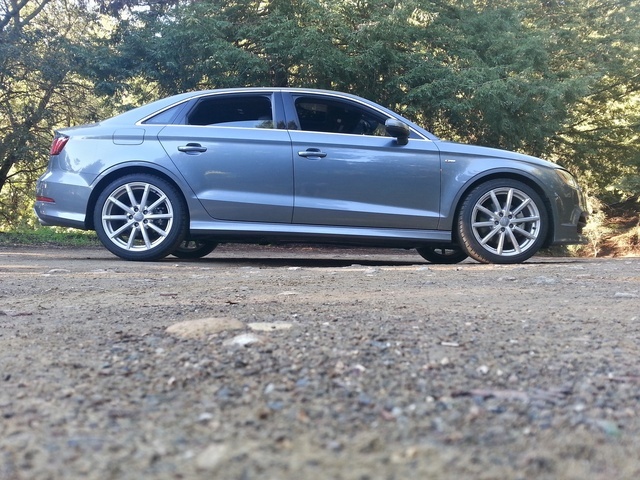 davywavy6 I have a 2015 Quattro 2.0 premium plus in Monsoon Gray. The cars interior looks and feels like a small army of jewelers perfected the look and feel of a european sport sedan. Easily one of the nicest cabins I've ever owned. I live in New England and the reaction is tremendous. And did I say it was fast, it hits ninety in heartbeat. I love all the tech gear but to be honest I bought it because of the styling and the engineering. A pleasure to own! Users ranked 2015 Audi A3 against other cars which they drove/owned. Each ranking was based on 9 categories. Here is the summary of top rankings. 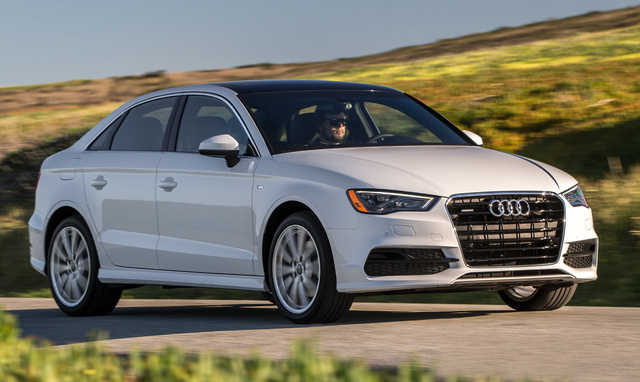 Have you driven a 2015 Audi A3? I would like to get a donut for my 2015 Audi A3 premium plus convertible. Tires size is 225/40ZR18XL 5hole. The car has not much space so I want a donut.